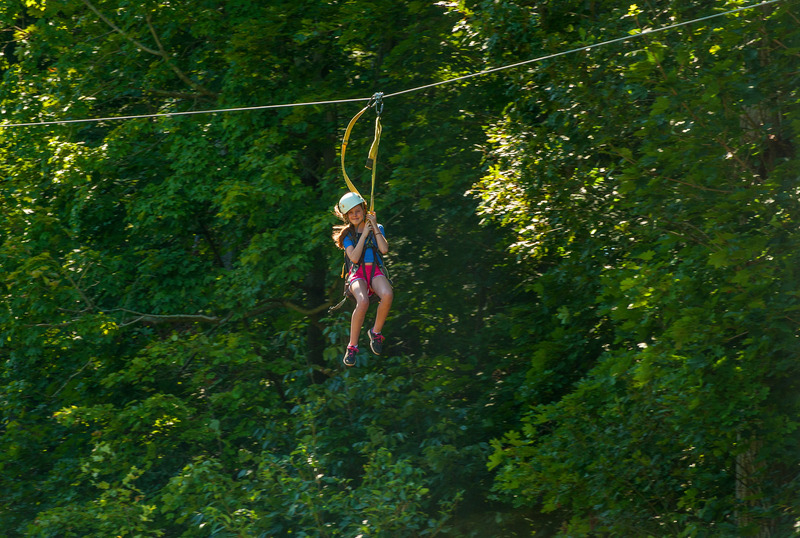 It would be tempting to think that two Montgomery County zipline sites only 13 miles apart would cancel each other out. On the contrary. They complement each other. In anticipation of August 23 as National Ride the Wind Day, I sampled the zippy thrills at both Elmwood Park Zoo and Spring Mountain Adventures. The zoo&apos;s course is an excellent introduction to the experience. As we blogged back in April, Treetop Adventure Park is woven into the network of massive trees on the property of this 90-year-old Norristown landmark. 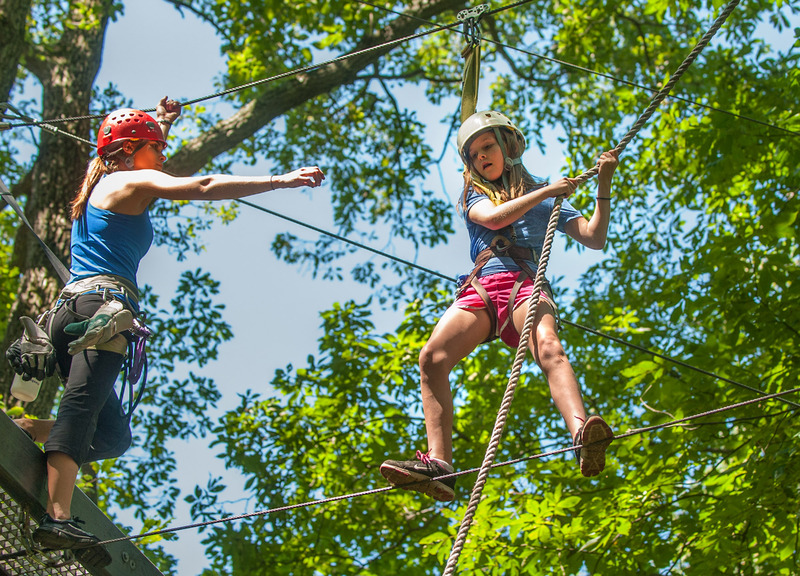 It offer two flavors of ziplines: a low-level set of "games" for youngsters and a set of platforms higher up, for older kids and adults. I arrive at the zoo just after opening, with my two teenagers: Kristin (13) and Claire (17). We check in, sign the necessary releases and harness up. The adventure begins with a lesson. Each harness has two tethers that end in a patented clip system called CliC-iT. The mechanics are fairly easy to understand but take some practice. Of the two catches, only one will open at a time, thanks to a locking system of strong magnets. Traversing the course requires locking one tether on a line before releasing and locking the second. Marketing material for this invention shows a Ford pickup truck being held by a CliC-iT, but even so, self-preservation instills just a touch of nerves. We practice standing on the ground: Open catch #1; attach it to the line; open catch #2; attach it to the line. It&apos;s a little tricky. We struggle with attaching the line in exactly the right position to lock the tether, and I briefly think, Are you really going to entrust this process to me? A novice? But with practice comes confidence. Kristin gets the hang of it quickly, and she&apos;s soon moving through the practice equipment. Claire masters it, too, and finally, the proper technique dawns on me as well. Treetop Adventure Park at Elmwood begins, not surprisingly, with a ladder climb into the treetops. I&apos;m designated first, and I scramble up after securing my Clic-iTs. Kristin follows. Claire climbs the first latter, looks at the height and immediately changes her mind about ziplining. She leaves the treetops and opts to be our cheering squad on the ground. Kristin and I start maneuvering around the games. The process of clicking in/out becomes second nature. We walk over wobbly wooden bridges, tight ropes, free-hanging bars and swinging planks, all high above the zoo&apos;s floor. Handholds along the way provide steadiness. I make it to the first zip, which will send me soaring over a trio of grazing elk. I attach my pulley and my lines and test that the harness is indeed holding. I step off the platform and zoom across. Midway, I worry about my baseball cap and wonder if, should it drop to the ground, the elk will find it a tempting snack. No worries. I make it intact. Kristin is next. She pauses. Sets her equipment. Pauses. Considers the distance. Sits in her harness. Stands. Considers some more. She decides that she&apos;s had enough. With the help of the onsite staff (very kind), she descends. I&apos;m on my own now. The longest zip occurs toward the end of the course and takes riders parallel to Harding Boulevard back toward the entrance of the zoo. I remember an earlier piece of advice from a crew member - "Do not brake on this line!" - and I step off. I take off and see immediately why braking would be a bad idea. Getting stuck midway would be both difficult and embarrassing to recover from. Fortunately, I attack this last line with sufficient oomph to make it. One short game sends me to the last platform, from which I climb down. The girls rejoin me for high-fives. Insider tip: Bring a handful of alcohol wipes. The tree sap can run heavily, and the pads are a great way to clean it from both skin and clothing. Elmwood prepped me well for tackling the canopy tour at Spring Mountain Adventures. The thought of starting a zipline course after a 535-foot ascension on a chair lift was intimidating for the girls, so I braved this one solo. I was, however, accompanied by two guides, Sarah and Miles, and five other adventurers: A mother and two grown daughters from Downingtown. And a local couple celebrating a birthday. The outing again started with training. Rather than CliC-iTs, Spring Mountain uses traditional carabiners. They are just as secure, especially since the pros are there every step of the way, checking and re-checking for safety. The Spring Mountain course is seven thrilling ziplines that bring riders all the way down from the summit. The platforms are higher than at Elmwood, and the runs are longer. Braking is also different; Spring Mountain uses an automated system that involves a weighted device that rests on the line and is engaged by the guides. When it catches, it&apos;s possible to both feel it reduce the rate of descent and hear it change the pitch of the line running through the pulleys: The unique sound of "Zzzzzzzz-RRRRRRR" brings you to a gentle stop. Many of these are similar to the Elmwood games, but the level of difficulty is bumped up considerably. For example, the Burma Bridge is a series of metal pads that are crossed by stepping on each one individually. The difference is, where Elmwood provides firm handholds, Spring Mountain relies on rope with plenty of play in it. Balance becomes key, and upper body strength is a definite asset. Miles and Sara, from years of experience, walk through each game effortlessly, bantering back and forth as if they&apos;re brother and sister, teasing each other and us. But they diligently protect against injury, explain each obstacle in detail, provide hints and tips and are big on encouragement and fun. I am a little shaky on the Burma Bridge. I&apos;m even worse at the Slack Line Bridge, which is like a tightrope but with much more "give" in the line. Sara, however, skips across it like she&apos;s out for a stroll on a sidewalk. The penultimate challenge is the Tyrolean Traverse. It is a thick rope - probably four inches in diameter - that requires hands and feet working in conjunction. The idea is to grab it palms down, swing the legs up to hug the rope and move forward in sloth-like fashion. I&apos;m not even sure I can get my legs up there, much less get myself across, but I give it a shot. I grab the rope and lift. To my amazement, my calves crisscross the traverse, and I&apos;m in good shape. I move forward. Hand. Hand. Calf. Calf. The difficulty, I soon discover, is ensuring that my feet don&apos;t tangle with themselves as I move. I have no idea about my progress. I just keep moving. About three-fourths the way across, I groan. My arms are giving out, and my sloth-like pace slows even more. Behind me comes immediate reassurance: "Don&apos;t give up, Dan! You&apos;re almost home." My burning arms continue their hand-over-hand advancement; my quivering thighs following. "Four more hands!" comes the info from the platform. I push on. A few scooches later, Miles is helping me off the rope. I&apos;ve made it. 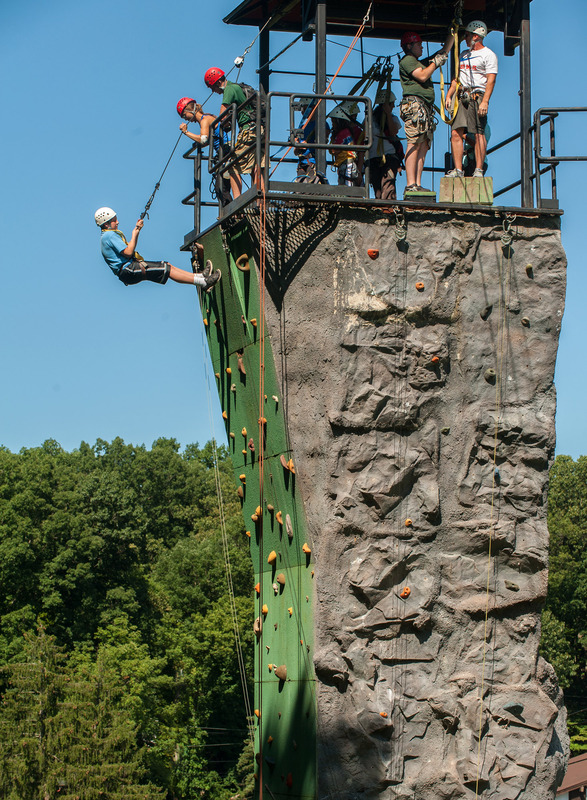 The finale takes riders down to a rockwall, from which a rappel brings them back to terra firma. The six of us make our way back to the lodge to return our equipment, chatting happily as the adrenaline continues coursing through the veins. Insider tip: Several of the lines at Spring Mountain offer the option to flip upside-down as you fly between platforms (an opportunity I passed on repeatedly). Take care to ensure that valuables (car keys! wallet!) are snapped in a pair of cargo shorts or zipped in a backpack. An adventure in the air, I learn, is a full body workout, meaning that once both feet are back on the ground, a good night&apos;s rest in a feathery bed is a worthwhile recommendation. If you need a line finding the best spots in the county to hang out in, see the accommodations list on our website. All that exercise is also apt to leave you hungry. To replenish the calories you&apos;ve burned, Montgomery County&apos;s restaurant scene (including the Garden Grille & Bar) has flavorful dishes full of zip and zing.